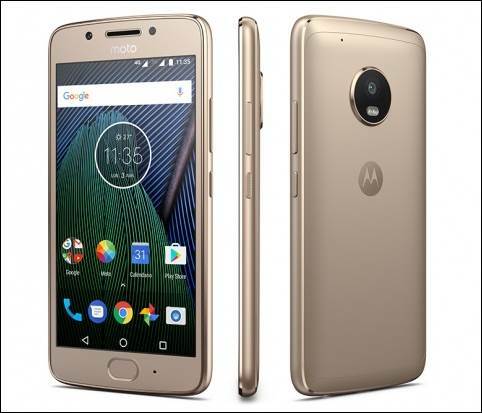 Motorola has just launched the Moto G5 and Moto G5 Plus at the MWC 2017 which was held in Barcelona on 26th Feb. The fifth generation of the Moto G smartphones now come with a full metal design and have an aluminum backplate. Both these smartphones may go on sale in March 2017. Both these smartphones share common specifications but some are different in the more premium Moto G5 Plus. And the good news is that the Moto G5 and Moto G5 plus are officially coming with Google assistant which has just started to roll out for non-pixel devices since 26th February 2017. 1. CPU & GPU: The Moto G5 is powered by a lower-end Snapdragon 430 chipset, 1.4 GHz cortex- A53 octa-core CPU, and Adreno 505 GPU while the G5 Plus comes with Snapdragon 625, 2.0 GHz cortex-A53 octa-core CPU, and Adreno 506 GPU which was expected in its previous version. Snapdragon 625 is known for its low power usage profile. 2. Battery: The Moto G5 comes with a 2800 mAh removable battery while the G5 Plus comes with a 3000 mAh Li-Ion battery that can provide a whole day backup without recharging again. Both these Motorola smartphones support fast charging. 3. RAM & Storage: The Moto G5 will come in two models that are 16 GB and 32 GB. The 16 GB model actually has 2 GB of RAM while the 32 GB model has 3 GB of RAM. The Moto G5 Plus will come in three models 16 GB, 32 GB and 64 GB with an option to choose from 2 GB, 3 GB, and 4 GB or RAM. The storage is further expandable to 256 GB via a micro SDcard. The variants are market dependent. 4. Screen: The Moto G5 features a 5 inch full HD IPS display with corning Gorilla Glass 3 protection. While the G5 Plus features a 5.2 inch full HD IPS display with 424 PPI. So the display is actually sharper than the previous G series smartphones. According to Motorola's Spain website, the G5 plus has AMOLED screen, but we can't confirm this as of now. An AMOLED screen was much anticipated for this smartphone lineup but it is still not confirmed whether Motorola Spain's website has put this information by mistake or not. 5. Android Version: Both the fifth generation of Moto G smartphones come with android 7.0 out of the box. However android 7.1.1 is the latest android OS. Both these smartphones come with January security patch updates. However, updates will be rolled out just after the official release. 6. Camera: The Moto G5 equips a 13 MP primary camera with f/2.0 aperture and PDAF. While the Moto G5 Plus packs a better camera with a 12 MP Sony IMX sensor with dual autofocus pixels. The same camera sensor is used by Galaxy S7 but camera performance is not comparable to Galaxy S7 because of hardware limitations on Moto G5 Plus. Both these Motorola smartphones have 5 MP selfie cameras and dual tone LED flash on the primary camera. The Moto G5 Plus can record 4K (2160p) videos while the former one is limited to full HD (1080p) recording only at 30fps. Neither of the two smartphones has optical image stabilization (OIS). 1. Fingerprint Gestures: On both Moto G5 and G5 Plus the fingerprint sensor is not just limited to locking and unlocking the phone. With some settings, it is possible to completely hide the navigation buttons from the screen and use some fingerprint gestures to open up the app drawer and navigate through apps via fingerprint reader's swipe gestures. 2. NFC: With NFC one can use his/her android smartphone to make payments. Only Moto G5 Plus has NFC and in the USA NFC will not debut on this model. 3. 4K Video Recording: This time 4K video recording has been added to Moto G5 Plus. The high-quality Sony IMX sensor records 2160p videos at 30fps. 4. Metal Design: The fifth generation Moto G smartphones now have all metal design which gives them a premium look. The Moto G4 lineup was criticized for its plastic body, but the G5 series doesn't look any cheap because there is no plastic chassis this time. 5. Dual Pixel Camera: The standard Moto G5 model has a 13 MP PDAF camera while the Moto G5 Plus has 12 MP dual pixel camera. Its camera sensor is supposed to be Sony IMX which can shoot sharp images with vibrant colors. Lack of OIS will not give produce good photos under low light. 6. Google Assistant: Moto G5 and G5 Plus are the second android smartphones to get the Google Assistant support after Nexus and Pixel devices. The Moto G5 is priced at $200 dollars and the Moto G5 Plus starts at $229 and may go up to $295 dollars for the 3GB-32GB model. The Moto G5 will go on sale in the U.S. in March 2017 while the plus variant will come in late April. In India, Moto G5 Plus may come on 15th of March 2017.